Americans are showing with their feet and their money how they feel about doctors’ offices and shiny hospitals, places they’re shunning more and more. 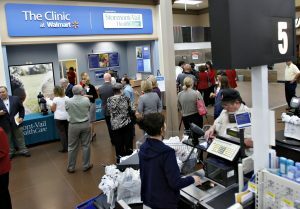 They’re racing to neighborhood clinics and urgent care centers that seem to be popping up on every suburban street corner and shopping mall. Before these facilities transform U.S. health care, would it be worth asking what this trend might mean, not just for profit-seeking retailers, drug store chains, and, yes, also hospitals and doctors who are shifting into new lines of business? The newspaper says that patients prefer the clinics and centers, not just for cost but also for convenience. They’re weary of traveling across town, then scouring for parking at imposing, major hospitals, which have become mazes of sleek towers on posh campuses. They aren’t crazy, either, about waiting in doctors’ offices, hanging too long with too many sick and cranky patients whose needs and conditions may be more severe. Why put up with a lot of hullabaloo just to get the kids shots or to have a fever checked out or a nuisance cut stitched up? Clinics and urgent care centers, at least for now, appear to offer treatment that’s as safe, effective, and high quality as can be provided in many doctor offices or even areas of many hospitals. It may be, though, this will hold true only until patient volumes and the complexity of cases both rise at these care giving spots. It also is true that information’s starting to build about risks at these facilities. But in comparison with hectic hospitals, where even concerted improvement efforts have been undertaken, newer, smaller medical care units lack an array of woes, including for now care giving-acquired infections and a proclivity to other medical error. Some studies estimate that as many as 250,000 Americans die due to medical errors, especially in hospitals. This would make such medical mishaps the third leading cause of death annually in this nation, exceeded only by heart disease and cancer. As far as the clinic and urgent centers’ comparative financial advantage — much of it attributable to lower costs of services offered by less-degreed caregivers like nurse practitioners or PAs working “to the top of their credentialing” — this, too, slips over time, research shows. The New York Times notes that studies, by the independent and nonpartisan RAND Corporation and others, have shown that patients come to like the services offered by the alternative facilities maybe too much. They go to them for added care and treatment that they might otherwise skip, thus actually increasing medical costs overall. It’s their increasing and high profit potential, of course, that may change patients’ views of retail clinics and urgent care centers, the newspaper reported. Big corporations, including CVS, Walgreens, and Walmart, and giant insurers like United Health Group, Aetna, and Humana find these operations irresistible for their bottom line. So, too, do many already huge hospitals and hospital systems. They find they can make higher returns on these smaller facilities, without big hospital overhead. Drug stores and retailers crave their foot traffic and patient spending — not just to fill prescriptions but also on impulse purchases. These outfits focus on profits and may lack histories or cultures focused on patients, their needs, and the safety, accessibility, affordability, and quality of their care. In my practice, I see the major harms that patients suffer while seeking medical services — whether in doctors’ offices, giant hospitals, retail clinics, or urgent care centers — and their struggles to access and afford safe, excellent medical care. Your medical care, as one physician has written, cannot be driven by a McDonald’s mentality in which patient volumes, cost cutting, and profit maximization matter most. Retail clinics, urgent care and specialized surgical centers are burgeoning and evolving not just because they are such improvements by themselves but also because they’re exemplars of major fails by hospitals and doctors in aspects of traditional care. Doctors who don’t keep up to date with medical developments and who devote mere minutes to each patient, racing in and out of examining rooms and clattering at laptop keyboards while showing their backsides, may not deserve to keep up practices. But patients, especially those with chronic conditions, should think long and hard about medicine’s profitable future. They’re not always easy to find but there are good, reputable, conscientious, compassionate doctors. The long-term insight and care they offer patients by seeing them, regularly and often over a lifetime, cannot be underestimated. We can’t lose the benefits they can offer by knowing us so thoroughly, our work, lives, friends, families, physical and mental histories and conditions, even our hobbies and pastimes. This knowledge and experience matters when patients get seriously ill. We need to be discerning enough so we don’t toss it away and make good medical choices, not just chasing the good for now treatment by Doc in the Box down the street. We also need to ensure that big-money corporations don’t degrade our medical services for profit’s sake — at good retail clinics, urgent care centers, doctor offices, and hospitals.